Those who take Genesis 1-11 as literal history are considered ignorant by the “more respectable” echelons of Christian academia. But it turns out that it is these scholars who are the ignorant ones, and there is documentary evidence to prove it. Two thousand years of recorded history which corroborates the testimony of the Bible was deliberately ignored and is excluded from the modern curricula. Bill Cooper writes that this evidence is not difficult either to access or to read, which means that much of Christian scholarship has either been duped by secular historians about the historicity of Genesis, or is deliberately lying to the people of God. One of the problems with exalting Enlightenment thinking over the Scriptures is that it disconnects theology from the real world. One is left to wade through and deal with the sometimes stimulating but mostly irrelevant tomes of philosophers who jettisoned our only source of light. The main reason modern Christians need to be up-to-speed on philosophy is to deal with godless philosophers in terms they can understand. I don’t consider myself to be up-to-speed, but from what I have read, many if not most of the questions they consider to be profound are really just the shadows left once Jesus is locked out. The average man has more pressing matters to contend with, and subsequently has a better grip on real life. For instance, we can spend hours swatting every available philosopher and lawyer on the existence or nature of natural law, and interact with all of them, or we could just ask the man on the land. Something a bit off-brand today, so don’t let it throw you. The beauty of true theology is that it is at home anywhere, applicable in any situation, and has something to say in the most mundane, most visceral, most public, and least abstract, situations. Israel took the man who was collecting kindling on the Sabbath and nipped his sin in the bud. His intentions were plain, so they wanted to know what should be done with him. 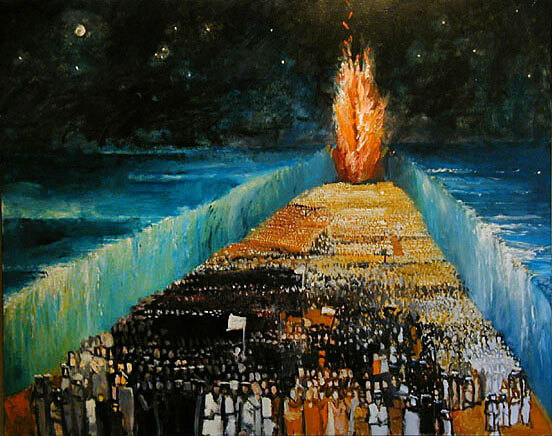 It sounds brutal, but Exodus and Leviticus give us a plethora of strange laws for Israelites. At least, they seem strange until we understand that not only was Sinai replicated in the Tabernacle, the Tabernacle was to be replicated in every Israelite tent, and indeed in every Israelite. Every household was a tent of God, a cloud, and every Israelite a burning star in the sky. The tribes were, after all, arranged around the tent in military “constellations.” This new Black Sabbath was to reconnect every tent with its source, the tent of God.